Why is there never a chocolate cupcake around when you really need one? Sighing in frustration, I finally shut the refrigerator door, more because I’m tired of not finding what isn’t in there and less to be energy efficient. I like something sweet first thing in the morning. A peanut butter cookie with bittersweet chocolate chips, cold leftover Panetone bread pudding, or the last square of carrot cake all make great accompaniments to my morning pot of let’s-get-going. I start each morning with a cup of strong, dark coffee in one hand, computer mouse in the other, as I settle in at my small brown desk in my home office with the huge window that looks out over my front yard. Sitting at my computer, staring at the sad little reflection on the monitor, I force myself to check the gazillion or so job websites in search of a new life, knowing full well that it likely won’t do much for my mood. I imagine the secret laugh fest that would surely take place after the hiring crew gets a look at my resume’ and makes bets on my age. While I was gainfully employed – with benefits and a generous 401k plan – I was more afraid of success than failure. What if I try new things and I’m wildly successful? What if Oprah calls? Will I change if I’m a fabulous overnight success? Now that I am suddenly unemployed and lacking any sort of plan for my swiftly approaching golden years, my fear of success has quickly turned into a nasty, debilitating fear of failure. What do I do now? Where do I go from here? What if Oprah doesn’t call? When the stress of the job hunt gets to be too much, I hit the QUIT button, put on my sneakers, and head out for a walk. I have come to eagerly embrace my daily walks around the nearby elementary school, more as a way to decompress than to exercise, although I’m sure my doctor would applaud my decision, especially if she knew I had 22 Fritos with my lunch yesterday. Walking doesn’t erase my problems, but it clears my head and keeps me focused on my search for solutions. Rounding the corner on the sidewalk in front of the elementary school, I take in all the usual activities. In the afternoon, the school parking lot is crowded with parents picking up children, big yellow school buses idling, ready to take on their boisterous cargo, a swarm of kids of all ages running about the playground like tiny ants released from a Mason jar. Skipping and jumping, they ignore the honking horns and moms with outstretched arms and bellowing voices. “Hurry up! You’ll be late for soccer practice, dance class, the orthodontist . . . ” or any other number of alerts I hear trailing off into the breeze. But on a morning walk, as I pass the multipurpose room and main building of the school, the air is filled with the aromas of the huge kitchen with its industrialized decor. Invisible clouds of cafeteria favorites ooze out from the windows and onto the sidewalk to meet me; familiar scents swirl all around to take me back in time. The ooey, gooey, creamy goodness of macaroni and cheese; hot, yeasty, mile-high dinner rolls softening the cold square pats of butter that cuddle up beside them; warm, cinnamony apple slices frolic with raisins in a brown sugar puddle beneath a flaky, buttery crust; huge, doughy peanut butter cookies nestle alongside one another on large, silver baking sheets, emitting an aroma that yearns for a carton of milk so ice-cold it needs to be held with a napkin to keep from losing a finger to frostbite. When I was a kid in elementary school in North Hollywood, my mother was a stay-at-home mom. She did the laundry, the ironing, the cooking and the cleaning. She made the beds, did the dishes by hand, and was a natural in the kitchen. When my sister and I came home in the afternoon, famished from a hard day at school, Mom fixed us a little something to tide us over until dinner: the brown sugar sandwich. As we watched in great anticipation, eye-level to the countertop, she gingerly buttered a piece of white bread, sprinkled the creamy yellow top with brown sugar, folded the bread slice in half and lovingly placed it in our outstretched, eager hands. It wasn’t the healthiest of snacks, obviously, but Mom likely thought it better and more filling than a cookie or a candy bar, which is what most kids might reach for in the snack department. Though I know I should opt for fruit or a carrot stick, these days I am more inclined to reach for a brownie or a cookie before the brown sugar sandwich of my youth. Which is exactly what I did after my walk. Thirty-seven minutes after I headed out on my trek around the school, I came back to my kitchen and the gooey, chocolately, nutty brownie whose snapshot had taken over every portal of my brain. Yesterday, I threw together half-empty remnants from my freezer, added a couple of boxes of fudge brownie mix, tweaked it a bit with a teaspoon of instant espresso powder (also always in my freezer), and came up with a nice batch of decadence. This is the brownie you want with strong coffee or good Port. It is satisfying and delicious – and quick to pull together. Oh, yummy, nutty goodness, you complete me. But as I finish the small brownie and lick the last of the softening chocolate batter from my fingertips, I can’t help but wonder . . . Calorically speaking, does a walk cancel out the brownie or did the brownie just cancel out the walk? 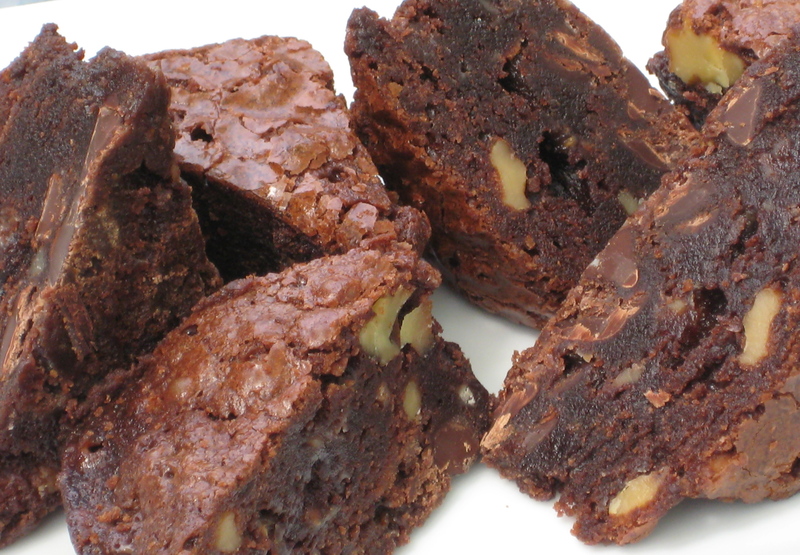 If a super-moist, almost doughy brownie is not your thing, then you may want to tweak the recipe to suit your desires. Perhaps use a smaller pan and cut down to one box of mix, or scale back on the chocolate chips. Again, this was a throw-together recipe. The fun is in taking a look inside your freezer or pantry to make a unique mix of your own. 2 boxes fudge brownie mix — not the brand that includes a pouch of chocolate sauce; follow directions on the box: if one calls for 2 eggs, you will need 4 if you are using two boxes, etc. This entry was posted in Comfort Food -- Sweet, Desserts and tagged brownies, chocolate, decadent dessert, fudgy, nutty. Bookmark the permalink. I made these beautiful scrumptious brownies and they were absolutely delish! I “had” to share them with the hubby and my mom. Good thing I made double! Thanks, Zorn’s mom . . . I, too, usually have to make a bigger batch than normal. Thankfully, they freeze beautifully when wrapped up good and tight. And it’s a nice surprise to open the freezer for an ice cube and notice you still have yummy brownies left! Score! Great blog. I love your stories and the recipes look delicoius. Keep them coming. Thanks, DB. I will definitely keep them coming! Promise to keep reading? Thanks so much! Glad to hear it!